I used silver and cream. The glasses are Waterford. We received them as gifts from our very close friends. They have snowflakes on them. The name place holders are crown silver frames. 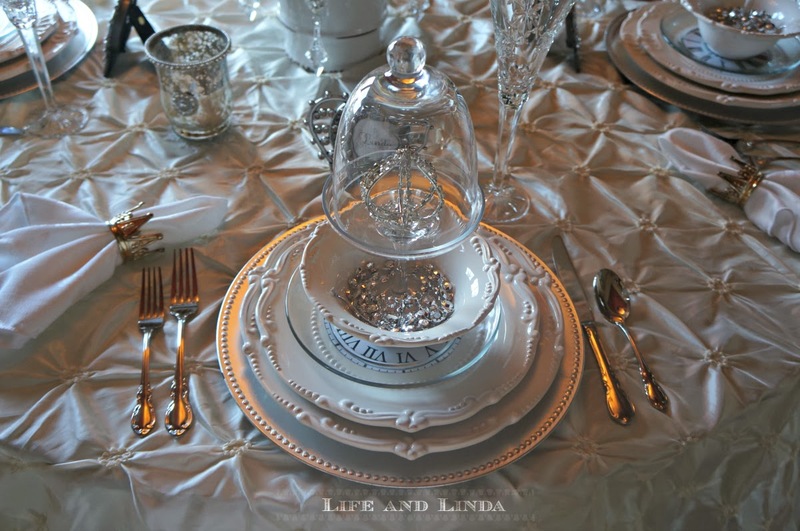 I used a decorative silver crystal crown inside each cloche. The napkins are also wrapped by crowns. 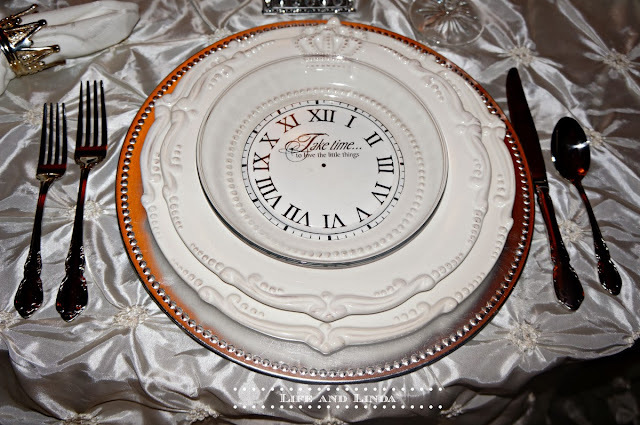 The clock plates are clear salad plates with cut-outs of clocks I found online. I used spray glue to attach them to the bottom of the glass salad plates. Mini cloches with a mini crown inside. Crown frames for place holders. I created the snowflake on the pc and added names. A silver crown sits on top of the white crown urn. An added crystal clock to complete the theme. Since our chairs are red fabric, I used cream pillow cases for the chairs and added sashes and a snowflake. It's been a rough year for me. I am now a three time cancer survivor. Having Ovarian cancer again this year really took it's toll. forward to a healthy and fun new year. Wow what a great celebration table! 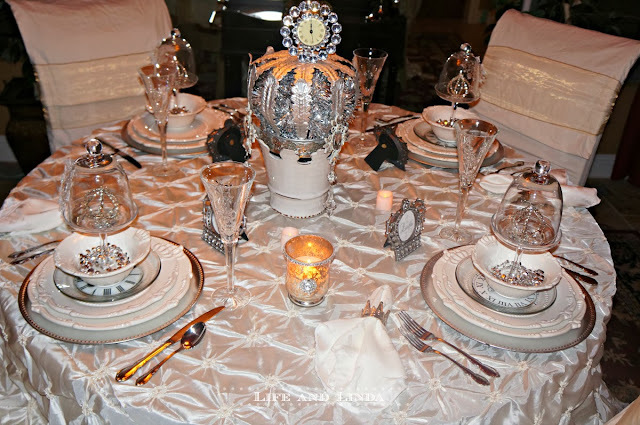 Love the crown centerpiece and your clock salad plates- great job! The chandelier looks so festive and the tablecloth is a beauty! Wishing you and Paul a very Happy New Year! 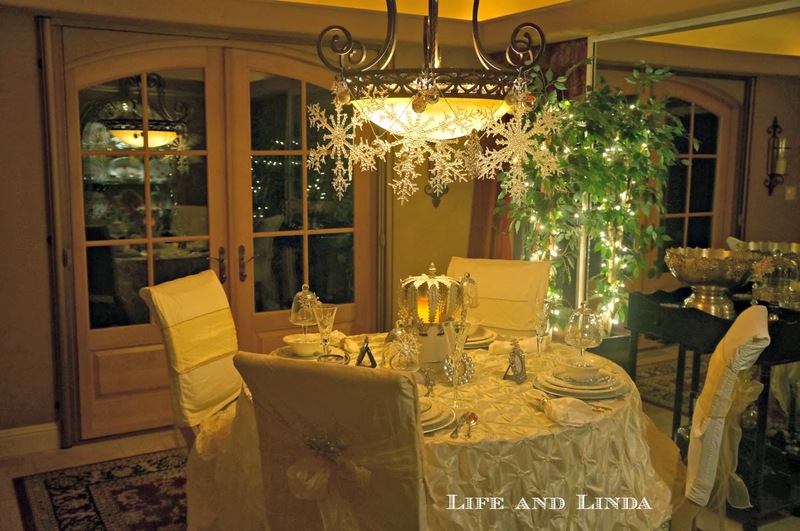 Oh Linda...your table is gorgeous!! I love the Waterford glasses and the Crowns!! Happy New Year! I'm loving your gorgeous tablescape; especially, your elegant clock plates mix with your other gorgeous China with your chair covers. You always share such lovely settings. I look forward to your posts. Wishing you and your family a Bless New Year. Hi Linda, Love love this table!! Your tablescapes are always so elegant! Wishing You a Wonderful New Year!! Wow! Gorgeous table Linda and I love the crown theme. Those mini cloches are so pretty! Happy New Year Linda! Your table is just gorgeous, and I hope you had a lovely dinner! It's now past midnight here and I just wanted to come by. Happy new year and best wishes for a healthy 2014. A beautiful table! Love the idea of clear salad plates and graphics of one's own choosing. Linda, wishing you a bright and beautiful New Year filled with good health, energy, and prosperity even as your soul prospers. It has been a joy getting to know you this past few months! This looks great, Linda! 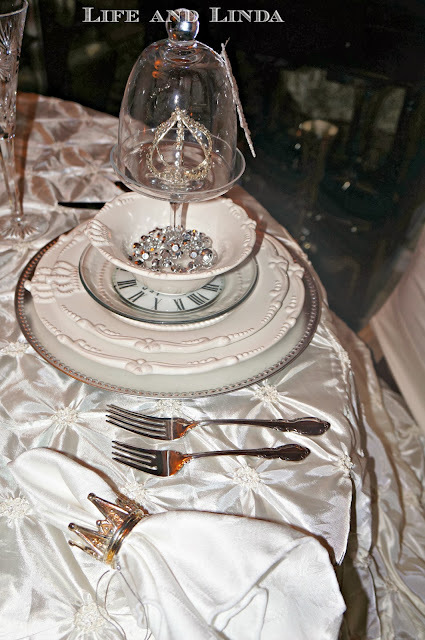 I love crowns and I was just looking at clock plates the other day and wondering how to get them. I never would have guessed they were a printout from online. Happy New Year! Best wishes to you for a healthy and prosperous new year! Your place settings are gorgeous, BTW! I have thought about you so many times over this year-knowing the battle you were fighting with cancer. God bless and keep you well and fully healed in 2014. I have loved getting to know you this past year- xo Diana Happy New Year, Linda!!!!! HI Linda, Thanks for visiting my blog. Hope you come back again. I"ll blog again on Jan. 6…. I LOVE LOVE LOVE your gorgeous tablescape. That is PERFECT for New Year's … Wow--how creative you are!!!!! Love the 'clock' plates. Food would taste better at a table like this.. Thanks for sharing. 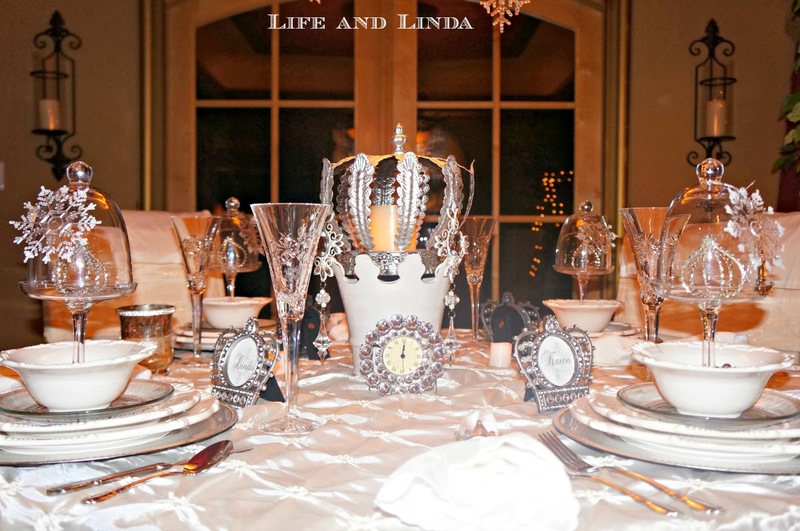 Linda, your table with the crown theme is a gorgeous way to welcome a new year. Every detail is stunning. 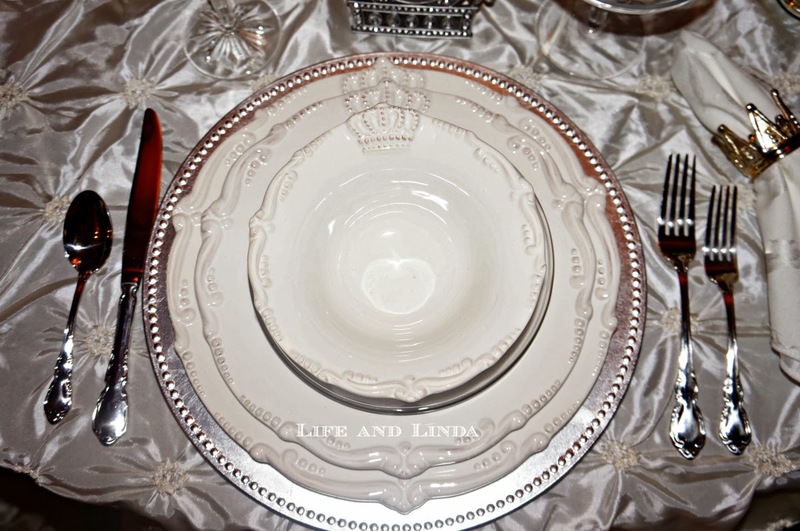 Love those crown embossed plates. Thanks for sharing. All the best to you in the coming year. You obviously deserve a great year. Happy New Year! 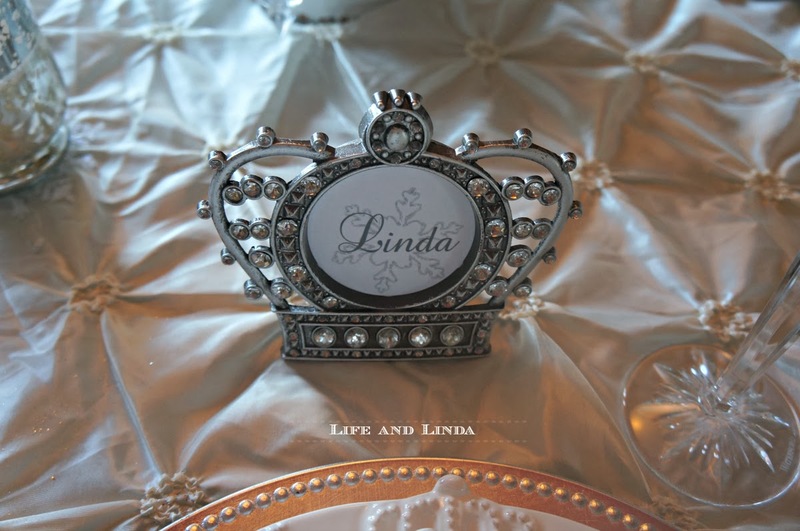 Oh, Linda, what a royal setting...everything looks so special! I hope that you rang in the new year with the highest anticipation for a fabulous, new year! I'm so happy that your health has now turned around and hope that you are finally feeling stronger! The use of the mini crown photo frames is so ingenious! Have a wonderful new year"
Linda, I am so glad that you are doing so well and I hope that 2014 is a huge turnaround from 2013 for you! You are a trooper and so full of energy - you amaze me! What a lovely table. I have those same dishes and I think they are my very favorite! I love the clock plates you made and how clever of you! Keep getting better and better! Such a beautiful and elegant tablescape, Linda, and your blog is lovely! Happy to connect with you through blogging. Many blessings on your year ahead… for good health and much joy! This so elegant and you carried the theme beautifully. Wishing you a healthy and prosperous year. Be Blessed!! I know this has been a super rough year for you, Linda, but the way you approached & dealt with it is laudable. I think Webster's Dictionary will now put your face next to the definition of "fighter." You have shown strength and grace throughout. Few could lay claim to the well-fought & balletic victory you can now claim. I wish you 100% health throughout 2014 and beyond! Your tablescape is so pretty, and I like the theme you chose. The snowflakes on the light fixture look really great, and the crowns under the mini cloches are so sweet! Great idea to use pillow cases to cover the color on your chairs! I hadn't thought of that! Wish I had before I spent hundreds of dollars on chair covers! :-) There are so many great fabrics out there in pillow cases....man, I wish I had thought of that!!! I also really like the little snowflake behind the names in the place cards! Cute idea! Best wishes for a healthy, happy, safe and prosperous 2014! Your table is like a work of art! Very beautiful! Oh Linda.You really outdid yourself with this setting. There isn't a single but detail on it (and in me you know that's a major feat ahahahah). Talk about giving the old a big kick on the... wherever. What a wonderful way to throw the old, all that's gone, and look forwad for more beauty and whimsy. Atta Gilr!!! Happy. Awesome. Great New Year to you, Beautiful and to Luckyiest Man in the World. I am so very glad you felt up to doing such a GORGEOUS table for the start of a MUCH BETTER YEAR for you guys! I adore your plates & all that pretty sparkle just shines with excitement & joy. I pray that 2014 will be an easier one for you & I truly admire how well you've handled every adversity that was set before you. You've been a great example to others. I doubt I could have been so positive & forward thinking. I love your beautiful home & all the delicious styling you've done to it. I pray you completely recover from last year & get back to dancin' up a storm! Your table looks absolutely incredible Linda! 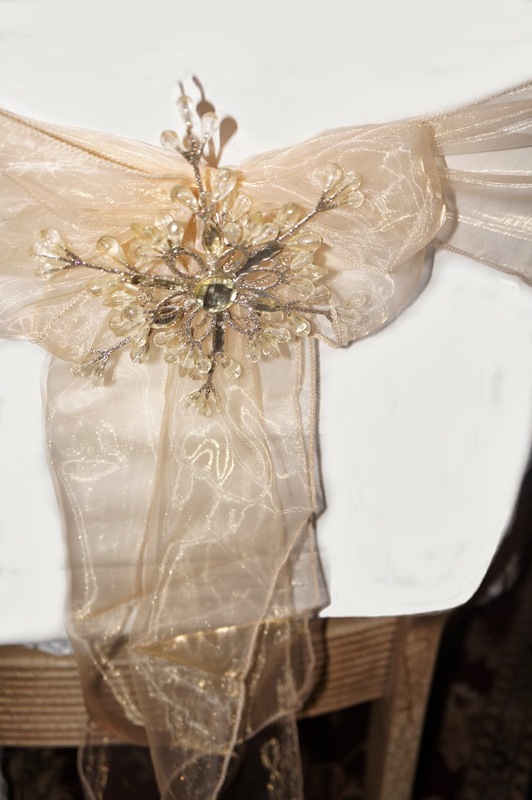 I just love crowns and your crown items are perfect together to make the table a celebration in itself. Everything you touch turns out beautiful!